Hello, and welcome to Alexis’ Psychic Boutique. A unique boutique specializing in New Age products. within Alexis’ Fairy Tales. 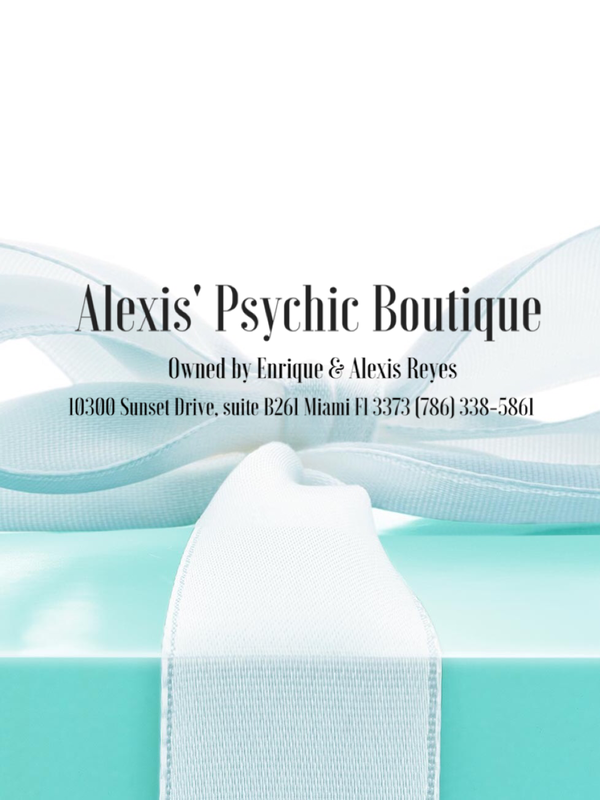 Now not only can your get a reading from Miami’s best psychic Alexis Reyes,but you can leave with the most amazing spiritual goodies .Such as, crystals, all kind of oils, from aromatherapy to fragrance oils.we also carry one of the best line of new age candles.And a wide selection of incense from sticks to cones. We have the most cutest little oil burners, and incense holder. You can also find all kinds of Sage for all your spiritual cleaning purposes. And we carry the must unique spiritual gifts from angels to fairies. And we also carry the unique and exquisite line Sun’s Eye of Mist and Spray a traditional blend of essential oil and rich herbs mixed together providing you with the most amazing mist and spray, that fit all your needs, and leave you with a wonderful scent of fragrance as it’s helping you with your spiritual guidance. Make an appointment, and shop at your own time, in the conveniency of your own time and privacy. Is for my reading,and life coaching Business where I can do my readings and where I don’t charge taxes. Is the Shop within Alexis’ Fairy Tales Inc.Where you can shop for all your spiritual and New Age needs. Where I have to charge taxes. Merging together on August 15, 2015 all underneath one roof . Enrique Reyes, it’s fully in charge of all the buying ,marketing and selling of Alexis’ Psychic Boutique.